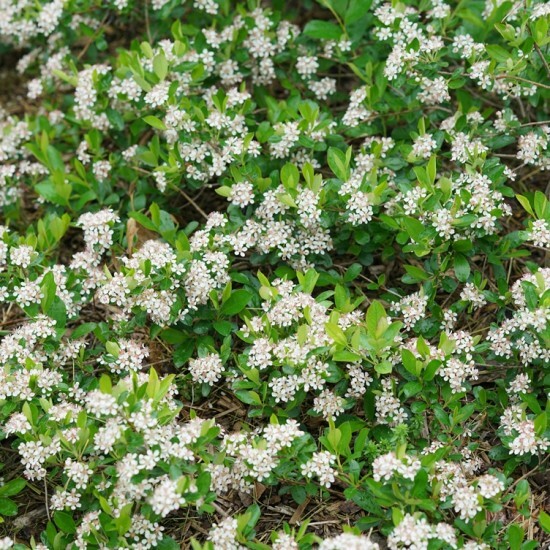 Ground Hog™ Aronia is a tough native shrub that naturally grows as a dense groundcover. This unique habit makes it the perfect plant for transforming difficult areas into beautiful, low maintenance plantings. In the spring it is covered with dainty white flowers nestled among the glossy green foliage. By the fall dark purple berries develop along with outstanding red foliage. 'Ground Hog' is very durable, growing well even in challenging soil and drier conditions. Aronia 'Ground Hog' is tolerant of a wide range of soil conditions including salt. It will gradually spread to make a dense groundcover. Little maintenance is required except to clear off winter debris like fallen leaves.